Word embedding is a mapping of a word to a d-dimensional vector space. This real valued vector representation captures semantic and syntactic features. Polyglot offers a simple interface to load several formats of word embeddings. A common way to investigate the space capture by the embeddings is to query for the nearest neightbors of any word. 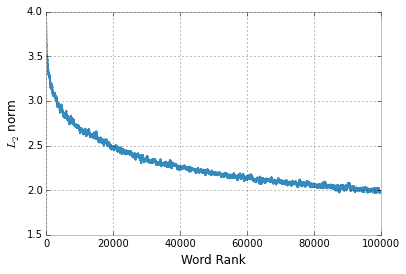 The word embeddings are not unit vectors, actually the more frequent the word is the larger the norm of its own vector. Not all the words are available in the dictionary defined by the word embeddings. Sometimes it would be useful to map new words to similar ones that we have embeddings for. To fix that, we apply another type of vocabulary expansion DigitExpander. It will map any number to a sequence of #s.